One of the new feature of Microsoft Office 2010 is the ability to upload documents directly to Windows Live SkyDrive account. This is through the "Save To SkyDrive" feature which is located at the Share tab under File Menu. To use it just follow these easy steps. 1. 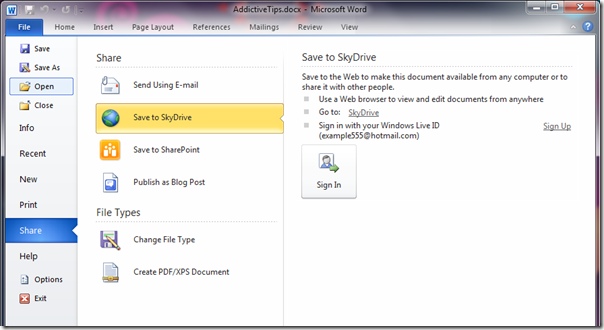 Go to File > Share then click "Save To SkyDrive". 2. Sig-in using your Windows Live ID. 3. Once login, it will display all available folders, now select the folder where you would like to save the document. 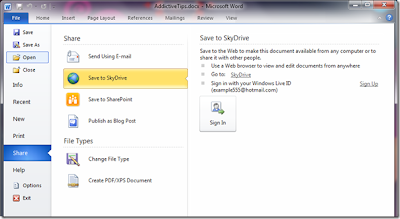 Save To SkyDrive feature is available in MS Word 2010, Excel 2010, and PowerPoint 2010.